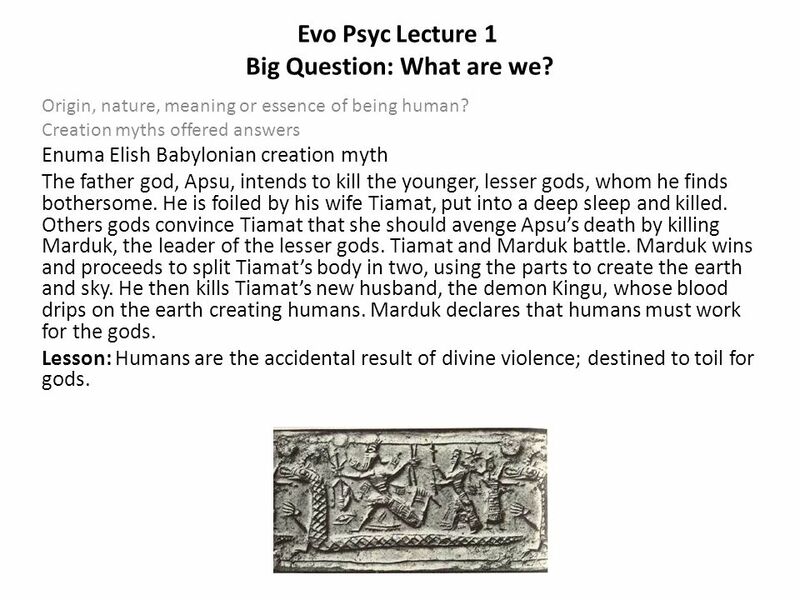 Evo Psyc Lecture 1 Big Question: What are we? Origin, nature, meaning or essence of being human? Creation myths offered answers ALGONQUIN Humans created. 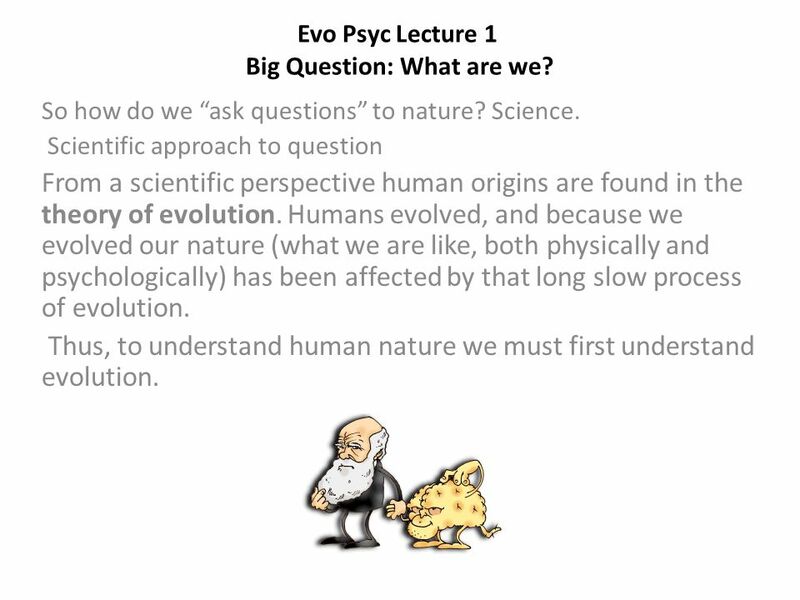 1 Evo Psyc Lecture 1 Big Question: What are we? Origin, nature, meaning or essence of being human? Creation myths offered answers ALGONQUIN Humans created from the body of “mother earth” by her wise son Glooskap. But Glooskap is killed by his evil brother Malsum, who is himself later killed but whose spirit now haunts humanity. Lesson: Humans are derived from “good” and “earth” but haunted (like other creatures) by dark spirits. 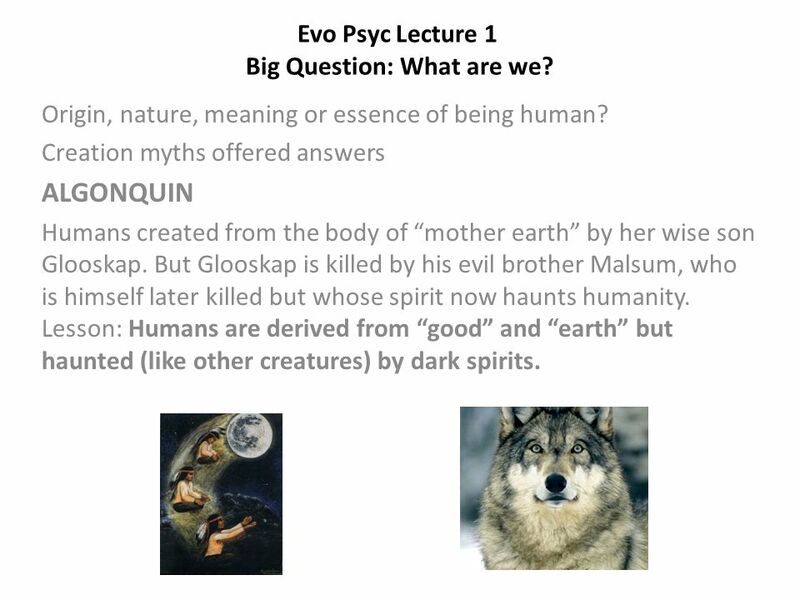 2 Evo Psyc Lecture 1 Big Question: What are we? Origin, nature, meaning or essence of being human? Creation myths offered answers GREECE -- AGES OF MAN Golden age: happiness, no labor or suffering, but in time arrogance, contemptuousness, destroyed men Silver: men had to work, they complained and fought among themselves – Zeus destroys them Bronze (1 and 2): men were resourceful, hard working, heroic, but war-like and they destroyed each other. Iron: current age, most men are rude, selfish, greedy only a few virtuous men, which why the gods don’t destroy us all. Lesson: Humans are self-centered and greedy with only a few virtuous ones scattered about. Our ancestors were often better than us, but flawed as well. The gods will eventually do away with us and try again. 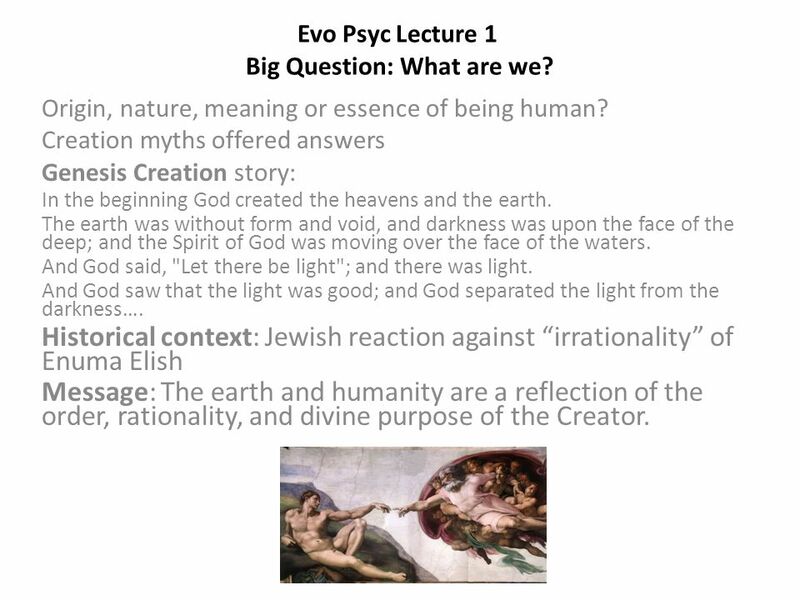 3 Evo Psyc Lecture 1 Big Question: What are we? Origin, nature, meaning or essence of being human? Creation myths offered answers Enuma Elish Babylonian creation myth The father god, Apsu, intends to kill the younger, lesser gods, whom he finds bothersome. He is foiled by his wife Tiamat, put into a deep sleep and killed. Others gods convince Tiamat that she should avenge Apsu’s death by killing Marduk, the leader of the lesser gods. Tiamat and Marduk battle. Marduk wins and proceeds to split Tiamat’s body in two, using the parts to create the earth and sky. He then kills Tiamat’s new husband, the demon Kingu, whose blood drips on the earth creating humans. Marduk declares that humans must work for the gods. Lesson: Humans are the accidental result of divine violence; destined to toil for gods. 4 Evo Psyc Lecture 1 Big Question: What are we? Origin, nature, meaning or essence of being human? Creation myths offered answers Genesis Creation story: In the beginning God created the heavens and the earth. The earth was without form and void, and darkness was upon the face of the deep; and the Spirit of God was moving over the face of the waters. And God said, "Let there be light"; and there was light. And God saw that the light was good; and God separated the light from the darkness…. Historical context: Jewish reaction against “irrationality” of Enuma Elish Message: The earth and humanity are a reflection of the order, rationality, and divine purpose of the Creator. 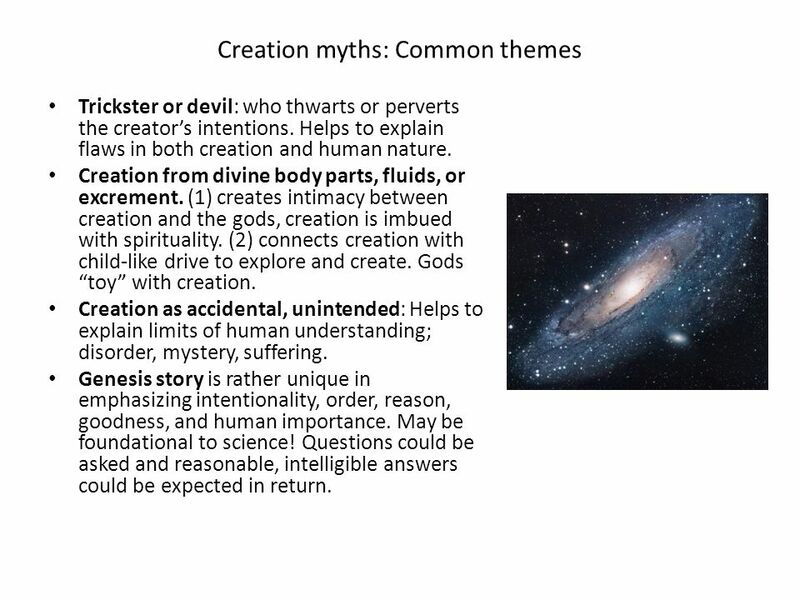 5 Creation myths: Common themes Trickster or devil: who thwarts or perverts the creator’s intentions. Helps to explain flaws in both creation and human nature. Creation from divine body parts, fluids, or excrement. (1) creates intimacy between creation and the gods, creation is imbued with spirituality. (2) connects creation with child-like drive to explore and create. Gods “toy” with creation. Creation as accidental, unintended: Helps to explain limits of human understanding; disorder, mystery, suffering. Genesis story is rather unique in emphasizing intentionality, order, reason, goodness, and human importance. May be foundational to science! Questions could be asked and reasonable, intelligible answers could be expected in return. 6 Evo Psyc Lecture 1 Big Question: What are we? So how do we “ask questions” to nature? Science. Scientific approach to question From a scientific perspective human origins are found in the theory of evolution. Humans evolved, and because we evolved our nature (what we are like, both physically and psychologically) has been affected by that long slow process of evolution. Thus, to understand human nature we must first understand evolution. 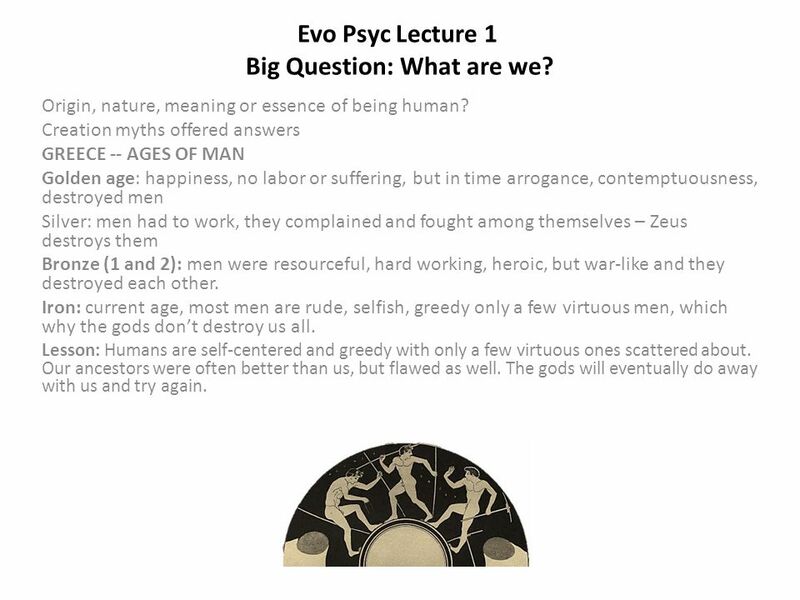 Download ppt "Evo Psyc Lecture 1 Big Question: What are we? Origin, nature, meaning or essence of being human? Creation myths offered answers ALGONQUIN Humans created." He Who Is Not With Me Is Against Me 14 Jesus was driving out a demon that was mute. When the demon left, the man who had been mute spoke, and the crowd. Johannine Warfare By Bro. John Michael Then the dragon was angry with the woman, and went off to make war on the rest of her offspring, on those who keep. A The Bible begins with a very spectacular claim: “In the beginning God…” “In the beginning, God created the heavens and the earth. The earth was without. EROS AND PSYCHE By Shannon Steel and Julia Story. The Origin of the Gods. In the beginning there was Chaos… The first legend tells the creation of the universe and a war for control over all of heaven. Compiled and Illustrated from The Scriptures & The Spirit of Prophecy July 2014 Presents Who are The Three Living Persons of The Heavenly Trio? Part 1. Surviving tablets from 1st millennium BC, but probably dates from 2nd millennium BC Origins in Babylon, used in rituals in city, esp. New Year festival. THE ENUMA ELISH AND GENESIS A COMPARATIVE STUDY. The Enuma Elish Area of Origin: Babylonian, from the fertile cresant region. Language of text: Akkadian. How the World and Mankind was Created. In the Beginning.. Chaos was everywhere. It was shapeless, dark, silent and empty. Chaos had two children named. Ovid’s Metamorphoses Ovid: 43 BC – 17 AD  Highly regarded by the emperor Augustus, until he was banished from Rome under mysterious circumstances in 8. The Jesus Curriculum Th e The Sermon on the Mount Matthew 5-7 Kingdom Handbook. Chapter Five, Lecture One Myths of Creation: The Origins of Mortals. In the beginning... When God began to create the heaven and the earth---the earth was at that time without form and void and darkness was upon the face. BASIC BIBLE DOCTRINES Bible Study Guide. BASIC BIBLE DOCTRINES | LESSON 5 – “Jesus, Our Saviour” INTRODUCTION The question is often asked, “What is God. 1 In the beginning God created the heavens and the earth. 2 Now the earth was formless and empty, darkness was over the surface of the deep, and the Spirit. Sunday School June 25, 2014 Creation Lesson 1 Origin of Universe.